And the best news? You don’t need lots of supplements or to follow any kind of extreme eating plan to fuel your running; you can achieve all of your nutritional goals by eating sensible, enjoyable, and tasty meals. To get the most from your running training, you need to think of food as fuel. That doesn’t mean you can’t enjoy what you eat. After all, eating, like running, is one of life’s pleasures. But, if you want to run as well as possible, you should pay as much attention to your diet as you do your training. Your body requires a balance of carbohydrate, protein, and fat to function properly. Where carbohydrate provides your body with energy, protein is required for muscle recovery and repair. Fat, another source of energy, is also important for your health but you don’t need to consume too much of it. The amount of energy in food is measured in calories or kilojoules. There are 4.2 kilojoules to a calorie, and a calorie is the amount of energy required to raise the temperature of a liter of water by one degree centigrade. If you do not consume enough calories, your body will be forced to use stored body fat for fuel. However, if you eat too many calories, in the form of carbs, protein, or fat, that energy excess will be converted to and stored as fat. The number of calories you need to consume depends on whether you want to gain fat, lose fat, or maintain your current body fat percentage. Gaining fat is not usually a goal for many runners as the extra weight will just slow you down. However, some runners would benefit from losing a little (or a lot!) of fat. 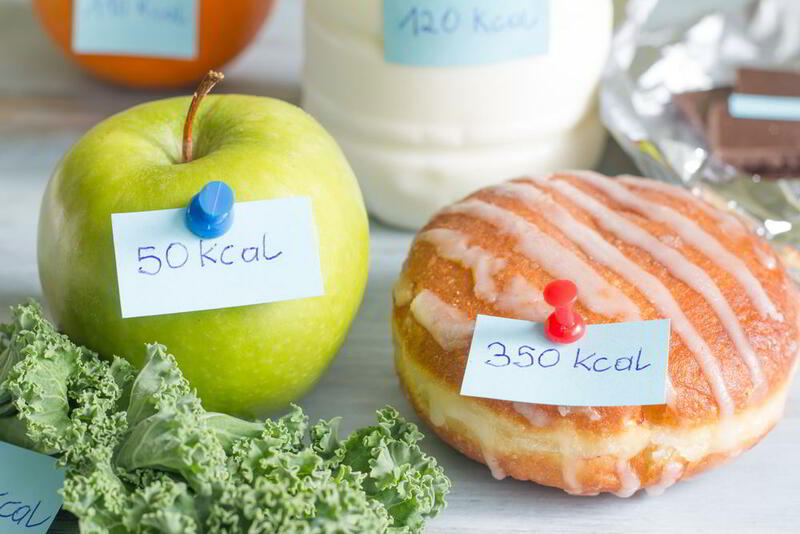 To calculate the number of calories you need to eat, you need to establish your Basal Metabolic Rate, BMR for short, and then make allowances for your training and daily physical activity levels. One way to do this is to use this a BMR equation. BMR does not consider your daily activity levels. It’s simply your energy requirements at rest. As a runner, you need to consider your training and also any other physical daily activities. That means our 75kg, 170cm tall, 30 years old exerciser, who we’ll say is moderately active, needs to consume 2576 calories per day to maintain their current weight. That’s 1662 x 1.55. If you want to lose weight, subtract around 300-500 calories per day from your TDEE. If you just want to maintain your weight, match your calorie intake to your TDEE. Eating more calories than your TDEE will lead to fat gain. If math is not your strong suit, or you just want to check your calculation, you can also use an online calculator – like this one. Select the Mifflin – St Jeor option as it is considered to be more accurate than the older Harris-Benedict method. While the amount of food you eat is undeniably important, what you eat is equally so. Your body needs more than just calories, it’s needs a variety of nutrients too. Without these nutrients, your body will not function properly, and your running performance will undoubtedly suffer. All of the food you eat falls into one of three nutrient categories, which are called macronutrients. Macro means big. 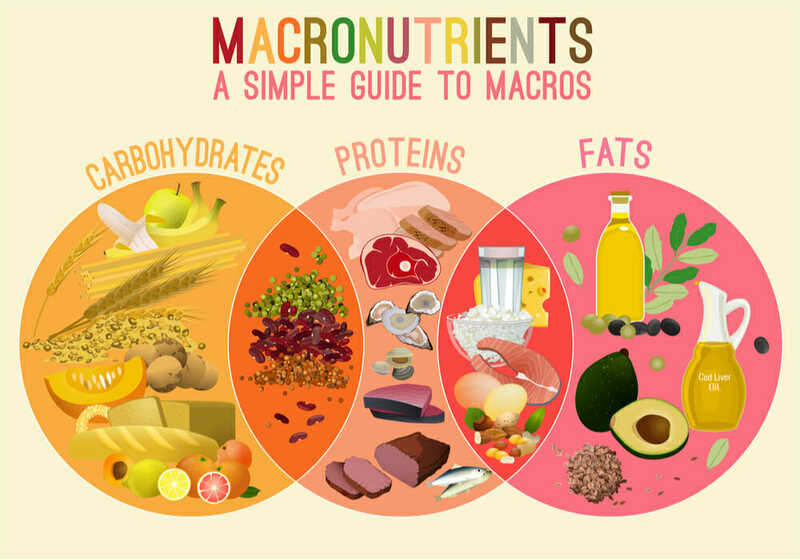 The three macronutrients are carbohydrate, protein, and fat. Runners need carbohydrates. Carbs, which contain four calories per gram, are broken down into glucose and used for instant energy or stored in your muscles as glycogen. Glycogen is then broken down and, along with fat, used to fuel your training. Examples of good carb sources for runners include rice, pasta, potatoes, bread, oatmeal, fruit and vegetables. Low levels of dietary carbohydrate and glycogen can severely impair your performance. You may have even experienced this for yourself if you have “hit the wall” during a long run or race. This happens when your body starts to run out of glycogen and starts trying to burn the protein in your muscles for energy instead. To ensure your muscles have all the energy they need, runners should consume carbs several times per day, especially 1-2 hours before and just after exercise. If you have a very long run or race coming up, you may benefit from increasing your carb intake for 3-5 days to “load” your muscles with glycogen in an attempt to ward off fatigue. If you have a very long workout planned, consuming carbs in the form of sports drinks or energy gels may help too. How much to eat: Carbohydrate should make up 50-70% of your daily calorie intake. The harder and longer you train, the more carbs you need. If you feel like you are lacking energy try increasing your carbohydrate intake. Your body uses protein for muscle growth and repair. While it’s unlikely you will want to build bigger muscles, it’s important to understand that running, like most forms of exercise, causes muscle breakdown, a process called catabolism. If muscle breakdown exceeds muscle recovery and repair, your running performance will decline. When you rest, your muscles repair themselves – providing you have consumed adequate protein that is. Your body rarely uses protein for energy; it would much rather use carbohydrates and fat. But, if you start to run out of glycogen, during the end of a marathon for example, it will make the switch to burning protein for fuel. This protein comes from your muscles and internal organs. This is very inefficient, and your body really doesn’t function well in this state. You can avoid this problem by consuming adequate carbohydrates before training. Protein, like carbohydrate, contains four calories per gram. Good sources include: eggs, fish, meat, poultry, dairy, beans and legumes, soy and nuts. How much to eat: Runners need more protein than sedentary people, but not as much as athletes engaged in intense strength training. Consume between 10-15% of your daily calorie intake in the form of protein. Fat often gets a bad rap in nutritional circles but it’s actually a very important nutrient. Fat is not only a source of fuel for runners, it’s also important for your health too. Fat contains nine calories per gram. The main issue with fat is there are several different types, and each one effects your body differently. Broadly speaking, there are four types of fat. Saturated fat – found in animal-origin foods such as beef, dairy and eggs, as well as coconut and palm oil. Your body likes to store and use saturated fat for energy. Monounsaturated fat – found in olive oil, avocados, nuts, and seeds. Monounsaturated fats are good for your cardiovascular health and feature heavily in the heart-friendly Mediterranean diet. Polyunsaturated fat – found in oily fish, flax seeds and oil, walnuts, and sunflower seeds and oil. Polyunsaturated fats are good sources of omega three and omega six fatty acids which are anti-inflammatory and are extremely healthy. Trans fats – found in takeout foods, processed foods, commercially-baked goods, and some margarines. Trans fats are considered to be very unhealthy and should be avoided whenever possible. When you run, your body uses carbohydrates and fat for energy. However, that fat is body fat and not dietary fat. Because if this, you should consume fats for their caloric content and health benefits rather than as a source of immediate energy. Even the leanest runner carries several kilos of fat on their body, and just one kilo (2.2. pounds) contains enough energy to fuel 77 miles of running – based on 100 calories per mile. How much to eat: Because fat contains a lot of calories, you don’t need to eat a lot. Too much dietary fat will easily be converted into body fat. However, a very low-fat diet could be unhealthy too. 20-30% of your daily calorie intake should be in the form of fat. Vitamins and minerals are collectively known as micronutrients, micro meaning small. Despite their small stature, the micronutrients are very important. In fact, insufficient micronutrients could not only affect your running, but your health too. Your body is essentially a big bag of chemical reactions. From your immune system to producing energy for your muscles, chemicals are interacting constantly. Vitamins and minerals act as catalysts to keep these reactions going. Too few vitamins and minerals will mean slow or non-existent reactions. For example, insufficient vitamin C will impair your immune system and too little vitamin K could delay blood clotting. Because intense training, runners need plenty of micronutrients. Running takes a lot out of your body, so it’s important you replace the resources your body has used. Too few vitamins and minerals could impair your running performance and your health, although consuming more than you need offers no real benefit. The best way to get enough micronutrients is to eat a varied, healthy diet based on natural foods. Processed foods are invariably stripped of vitamins and minerals whereas fruits, vegetables, unrefined grains, organic and free-range meat, dairy, and fish contain plenty of micronutrients. Limit your consumption of processed food and eat foods that are as unrefined as possible. Eat at least the recommended five portions of vegetables and fruit per day and try to vary your meals so you get a broad spectrum of nutrients. Fiber is a type of carbohydrate, although your body cannot digest it for energy. Because of this, it passes through your digestive tract relatively unchanged, removing waste and dead/old bacteria to keep your gut healthy. Unprocessed fruit, vegetables, and grains are all good sources of fiber. In contrast, processed foods contain very little fiber. Too little fiber could impair intestinal function and even lead to constipation and diverticular disease. Eating mainly healthy sources of carbohydrate, i.e. vegetables and whole grains, should ensure you get the recommended 30 grams of fiber per day. Water contains no calories, very few micronutrients except a few trace minerals, and yet it’s the most important thing you consume. You can last several weeks without food, but just a couple of days without water. Your body uses water for a wide range of functions, including temperature regulation, lubrication, toxin removal, and as a suspension medium for cells and chemical reactions. 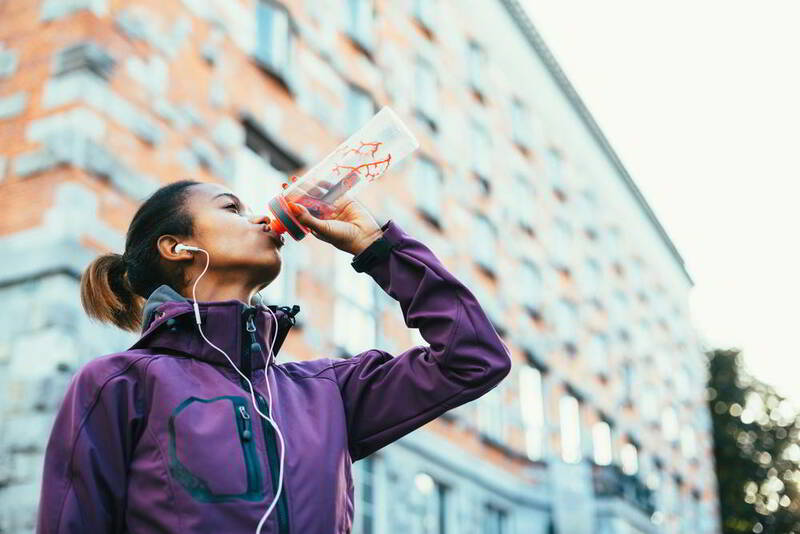 Dehydration can have a big impact on your running performance and losing just 2% of your body’s water will reduce your running ability 10-20%. The more dehydrated you are, the worse your performance will be. This drop in performance occurs for lots of reasons including elevated heart rate and increased core temperature, as well as electrolyte (mineral) imbalances. There are no set guidelines for water consumption as the amount of water you need depends on how hard and often you run, the temperature, your body weight, and whether you are a heavy or a light sweater. No discussion about nutrition would be complete without mentioning sports drinks and energy gels – two running staples. Both can be beneficial but are by no means compulsory. 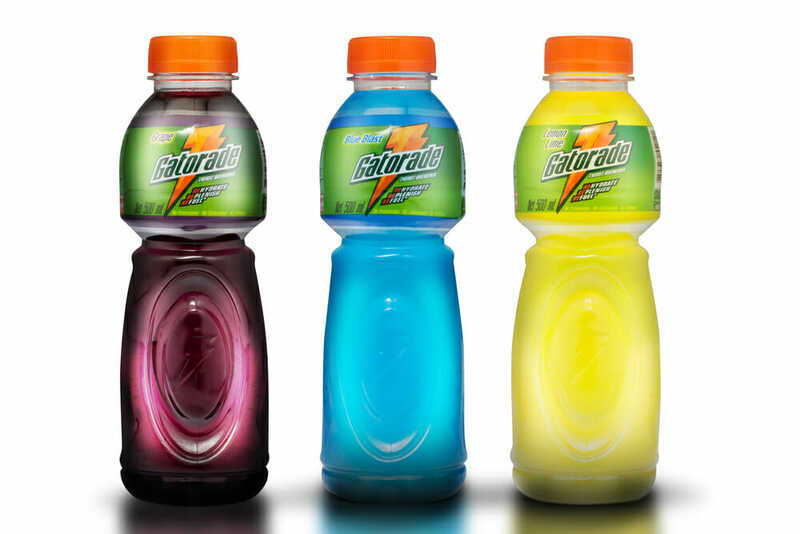 Sports drinks usually contain carbohydrates and minerals called electrolytes. The carbohydrates will provide your muscles with energy to ward off fatigue, and the electrolytes replace the minerals you lose when you sweat. Sports drinks can be useful during long training sessions, such as your weekly long run when training for a marathon. They could help prevent you from hitting the wall as consuming carbohydrates during exercise will help spare your muscle glycogen stores. Most sports drinks contain a range of different sugars which are digested at different speeds. This should mean they provide a mixture of instant and sustained energy. However, it’s also important to note that sports drinks are highly processed and are not automatically healthy. They are, after all, loaded with sugar and artificial additives such as colors. They can also upset your stomach. In many ways, sports drinks are a lot like soda, and even contain a similar amount of calories and sugar. If you do choose to use a sports drink, save it for those long training runs and races when you need an energy boost. The rest of the time, plain water is probably all you need. Energy gels are concentrated doses of carbohydrates. Fast acting and easy to digest, energy gels can be useful when you need a boost but cannot eat solid food. Some also contain caffeine to give you even more energy. Like sports drinks, energy gels are basically a processed food, so you should not consume them all the time. However, during a long race or training run, they could help ward of fatigue and push back the wall. It’s important to note that digesting energy gels requires water, so you still need to pay attention to your hydration levels too. Protein is essential for muscle recovery and repair. Your diet should contain 10-15% protein. Established personal trainer, health and fitness lecturer, web site manager, author and freelance writer, Patrick has been published many times in print and has written and published three books. Highly informative and clearly written piece! Thank you! !